I am working on creating a Attribute Expression that would display HTML with quotes in the field. 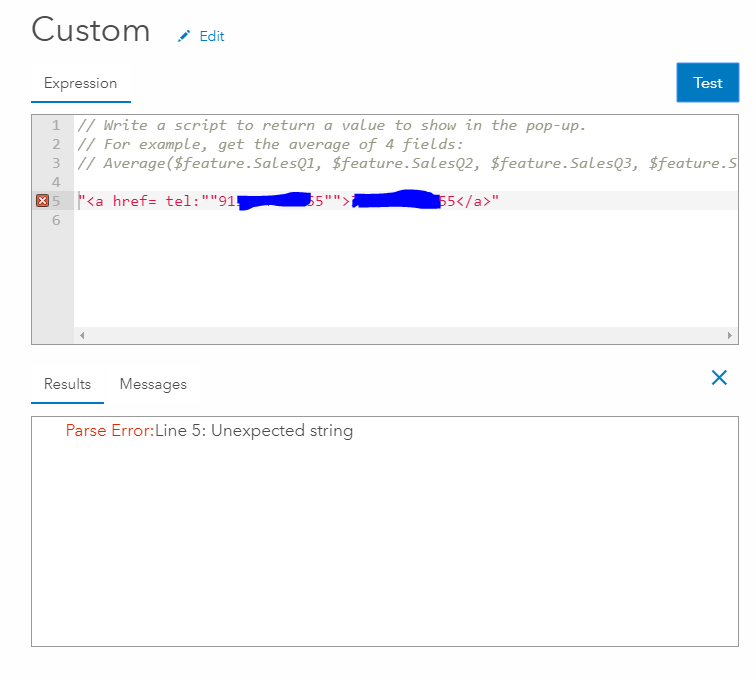 I tried putting double quotes for the inner quotes, but I keep getting "Parse Error: Unexpected String". Here is how I am writing out the expression which I know works with Python. Does anyone know how to print out quotes within a text field using Attribute Expression? I ended up using the "TextFormatting.DoubleQuote" function in arcade in order to accomplish this. "<a href=tel:" + TextFormatting.DoubleQuote + PhoneNumber + TextFormatting.DoubleQuote + ">" + PhoneNumber + "</a>"
Not the answer you're looking for? Browse other questions tagged field-calculator arcgis-online arcade or ask your own question. How to combine text and integers in a string field? Extracting data from HTML field in table using ArcGIS Desktop?